I just received this really cool item from Monster Promos. 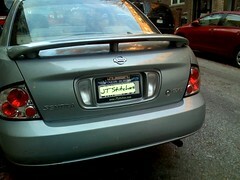 It's a custom made licensed plate frame with my shop's banner on the top & the URL on the bottom. 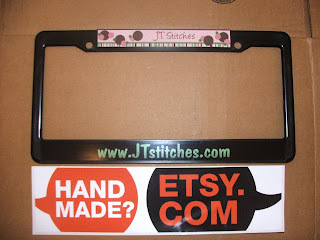 I choose to have my website http://www.jtstitches.com/ because is has all my sites in one place & it's easier to remember. I plan to take a picture of it on my car but for now this is what I have, not a great picture but the frame looks awesome! To get a better view go HERE. I think it came out really good. The web URL is real easy to read too--it will be a great advertisement while sitting at all the lights on the NYC streets. If you're looking for any promotional items check out their shop. They shipped really fast & I got this really cool bumper sticker for free!